Don’t get me wrong…I love a traditional slice of saucy, cheesy pizza as much as the next person (preferably dipped in a bit of bleu cheese dressing). But there’s something about a slice of white garlic pizza which makes my taste buds do a little happy dance. 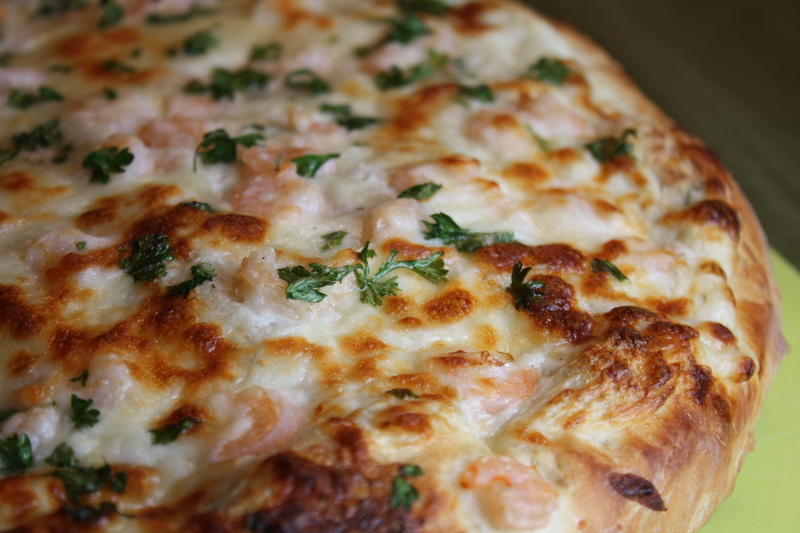 And last week, my happy-dancing taste buds decided that a homemade white garlic pizza, with a generous topping of tiny shrimp, was exactly what we needed. Truth be told, I made this pizza twice last week. I had initially planned to post the recipe on Friday, but my first take on the pizza was less than ideal. It was garlicky and delicious, but the proportions of sauce and cheese to the dough were off kilter. On top of being too heavily sauced, the ricotta layer cooked up into a bit of a mess. I figured that all it needed was a little reduction on the toppings and a touch of egg white to bind the ricotta. I was about to post the recipe with my theorized improvements, but made a last minute decision to run another test. There were no complaints in our household about having this pizza twice in the same week! The second run-through was a definite winner! As part of our Kids Cook Monday series, I invited my little helpers into the kitchen. 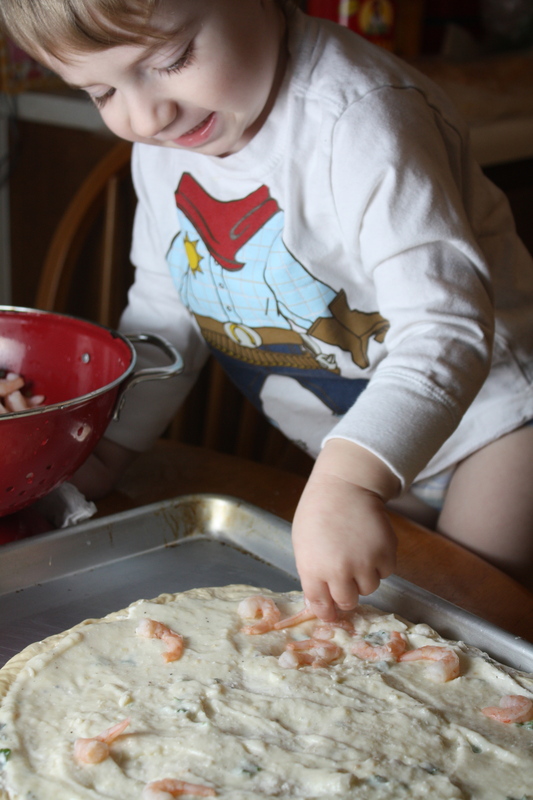 Pizza making is ripe with opportunities for young children to get involved. 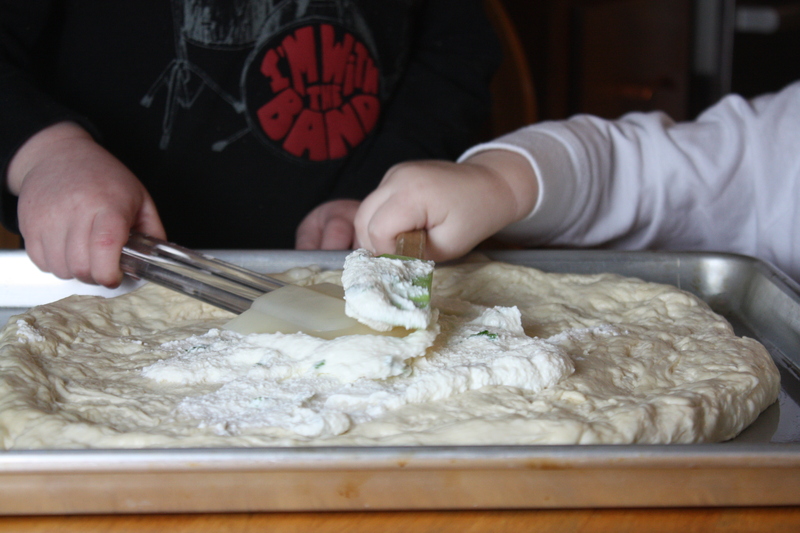 Stretching dough, spreading sauces, arranging toppings, and scattering cheese are ideal tasks for little hands. Kids benefit in a number of ways while cooking. They develop math skills while measuring, fine motor skills while spreading and arranging pizza toppings, health and safety skills while washing up before cooking, and language skills while following directions. But, in my opinion, there’s no bigger reward than the proud smiles on their little faces as our family sits down to enjoy the meal they had a hand in creating. 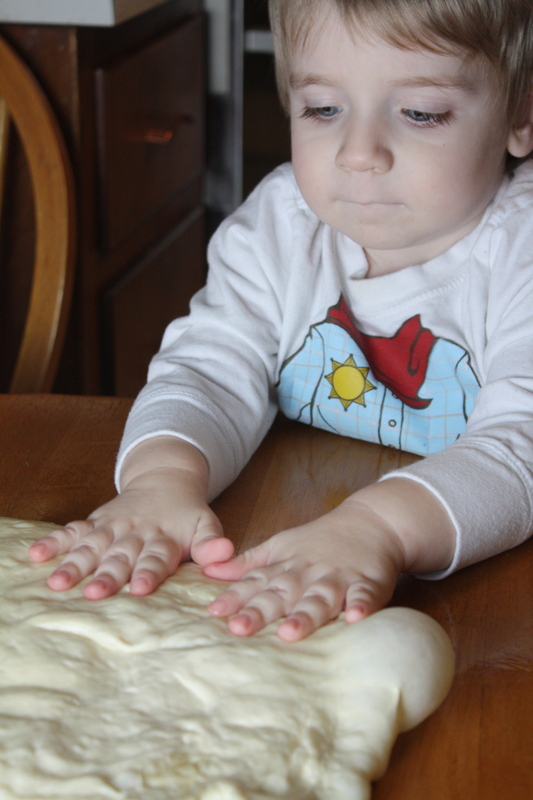 *Click here to see my post on making homemade pizza dough. Preheat oven to 450 degrees. If using pizza dough, stretch the dough into a large round and arrange on a pizza stone or large baking sheet, lightly greased with olive oil. Prepare the ricotta by combining the ricotta, egg white, garlic, parsley, and salt. Prepare the garlic sauce. In a saucepan, melt the butter over medium heat. Add the minced garlic to the butter. Cook for about two minutes. Add the flour to the mixture and stir. Cook for about 3 minutes, stirring frequently. Gradually whisk in the milk until smooth. Bring to a simmer and continue cooking for 4-5 minutes, until the milk begins to thicken. Turn down the heat. Add the cheese, salt, and pepper. Stir to combine. To assemble the pizza, spread a thin, even layer of the ricotta mixture over the pizza dough. Then, spread a thin, even layer of the garlic sauce over the ricotta. Scatter the salad shrimp over the sauce. Sprinkle with the mozzarella cheese and parsley. Bake for 15-20 minutes. Posted in Cheese, Food, Main Course, Recipes, Sauces, Seafood and tagged cheese, Cooking, cooking with kids, family, Food, food photography, kids, Kids Cook Monday, pizza, Recipes, seafood. Bookmark the permalink.